Yoshino (吉野) is one of the most popular tourist spots located in the middle of Nara Prefecture. As a part of Kumano-kodo pilgrims, it is registered as the UNESCO World Heritage Sites. There are many historical buildings that appear in the important events of Japanese history. Some of them are also registered as the national treasure of Japan. Also, it is very famous for Sakura spots. There are 1000s of Cherry Blossom blooms in April. Important cultural property, Kimpusen-ji Temple Kane-no-Torii Gate. Although the year of constructions of this torii gate is unknown, allegedly the original gate was built using the copper that remained after casting of the Great Buddha at Todai-ji Temple (Nara), the creation of which was ordered by Emperor Shomu, Several documents, including Taiheiki, suggest that the torii gate was destroyed in 1348 by a civil war fire. After reconstruction of the gate, however, a document indicates that the gate was destroyed again in 1706 by a fire, and then rebuilt in 1711. The present structure is the oldest existing copper torii gate in Japan. Measuring 8.2m in high, and 7.4m wide. Designs of jewels and lotus petals are cast on the lowest parts of the pillars immediately above their stone bases. A tablet attached to the top crossbars reads Hossin-mon, the gates' name. The Torii gate marks the boundary between the secular world and sacred grounds. Going through the gate, followers of Shugendo determine to leave the secular world to commit themselves to ascetic religious training in the deep mountains in order to reach enlightenment. Together with other three gates, namely Shugyo-mon, Togaku-mon and Myogakuk-mon, Hossin-mon comprises four gates along the approach to Sanjo Zao-do Hall situated atop Mt. Sanjogatake. The copper torii gate is known as one of the three most celebrated torii gates in Japan, the other two being the wooden gate in Miyajima and Tennoji. The inception of the 170km long Omine Pilgrimage Route derived from the legend of the priest En no Ozune, Who journeyed into the mountains from Kumano, through the harch, but serene, a ridge of Omine Mountains to the Yoshino Mountain Range, while practicing ascetic Buddhism. Since establishing the embodiment of mountain worship and esoteric Buddhism through religious fusion in the 9th centry, this rouute bas been effering a stage for asectic practices to the Buddhist priests for centuries. Along the route, 120 sites were has marked for pilgrimages in the 12th century. Be the 17th century, the number had been reduced to 75 significant places, such as mystic cliffs, caves, waterfalls and hospices. Portions of this untouched and well-preserved historical route consist of a stone or earth path less than a meter wide. The approach to the temple Kimpusen-ji consists of a main black gate (kuro mon), a copper gate (hossin mon) and a final gate (Nio mon). 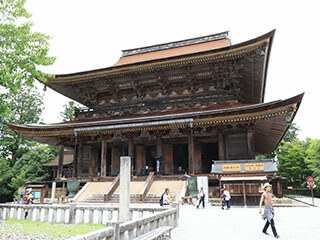 The main hall is a magnificent two-story structure thatched with silver cedar bark. It was rebuilt in 1592; however, it is possible that the foundation dates beyond the oldest documentation of 1103. The main hall is constructed of 68 wooden pillars and measures 27.3m wide, 25.8m long and 33.8m tall. An especially unique pillar was carved from the trunk of a rare azalea tree. The main hall of Kimpusen-ji is consecrated by the three great images Kongo Zao Gongen, which is the object of mountain worship fused with the Buddhism. For this reason, Kimpusen-ji is generally referred to as Zao do. Yoshino Mikumari Shrine is one of the UNESCO world heritage sites located in Yoshino, Nara Prefecture. Yoshino is one of the historic site and the route to the Kumano Hongu Shrine. This shrine was established over 1,000 years ago. The buildings were constructed in the late 16th century and registered as the national important cultural assets. It has the unique style of the building that has the feature of Momoyama period art. Gumpoen Garden is one of the Japanese style garden located in Yoshino, Nara Prefecture. It is considered as one of the 3 major gardens in Nara prefecture. It was built in the late Muromachi period (late 16th century). It is a typical pond surrounding style garden. In falls, it has beautiful autumn leaves. Nyoirinji Temple is one of the popular temples in Yoshino, Nara Prefecture. It was established during 901 to 922. During the middle of 14th century, this place was settled as the temporary imperial court and this temple was the main temple of Emperor Godaigo. There is a beautiful 3 stories pagoda and the mausoleum of Emperor Godaigo. Kimpu Shrine is located in Yoshino, Nara Prefecture. This place is the deepest place of Yoshino Mountain. It was used to be the largest Shugendo place of Yoshino. In 1185, Minamoto no Yoshitsune hid this hall.